I like words, but I prefer to communicate visually. One of the more frequent modes of my visual communication is the shared screenshot. I snap and share screenshots dozens of times per day. ⌘-⇧-4 and I are close friends. Must be drop dead simple to use. I press a keyboard shortcut, drag my screenshot area, and the screenshot is uploaded, and its URL is copied to my clipboard. No unnecessary steps. I've been burned in the past by having a large number of files trapped on an overpriced service. I won't make that mistake again. From now on, it's my personal S3 bucket, or bust. I regularly post screenshots into Campfire. 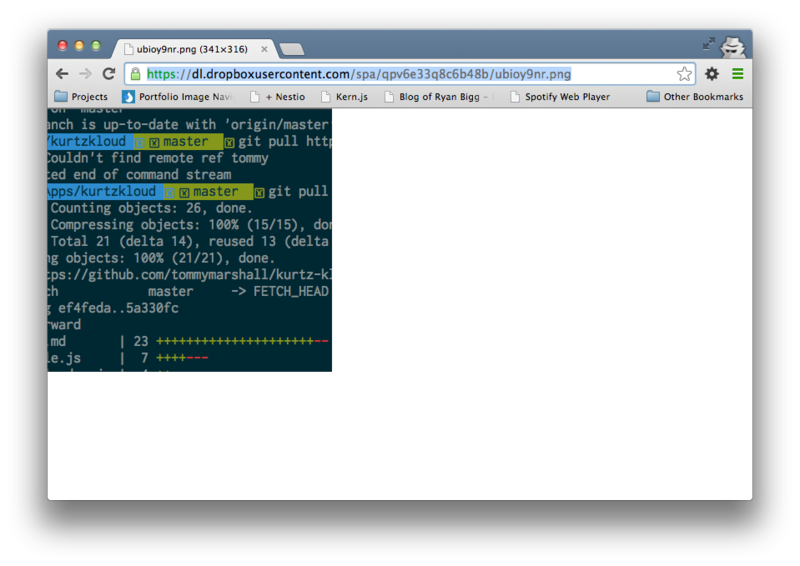 URLs to HTML wrapper pages that contain a download link do me no good. I need the actual file's URL copied to my clipboard. The best price. Bonus points for open source. CloudApp is the sleekest screenshot app out there. The design (visual and experience) is stunning, and it can be used for more than just screenshot sharing. Great interface for reviewing previously uploaded files. Very full featured. Drag and drop file sharing. Very restrictive free tier. Only 10 files per day before you have to start paying. BYOStorage support! In addition to providing their own storage service, users can opt to upload to S3, Rackspace, or server via FTP. URL copying doesn't work when using S3 storage. Ads. But hey, it's free! Ewww... a wrapper page... with ads. *Evernote does offer a paid Premium tier, but I've never encountered restrictions on my free usage. Phew, finally a service that gives us a URL to the actual file! 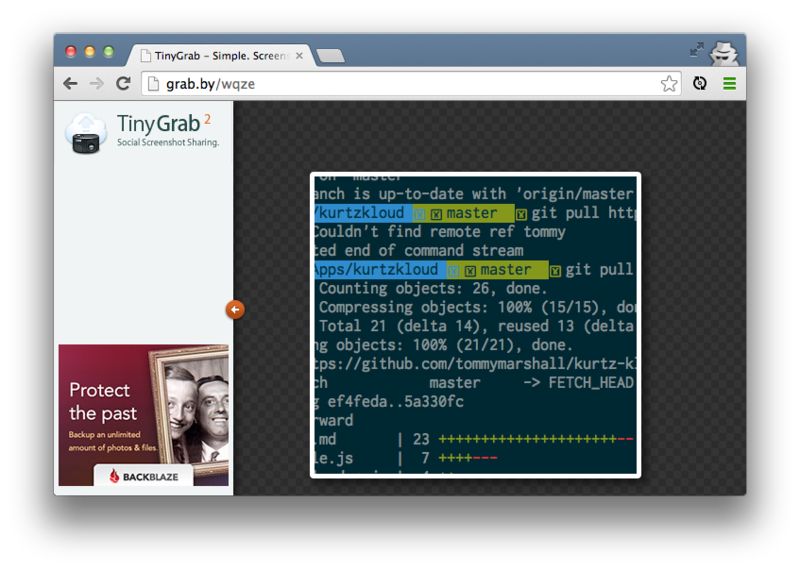 Awesome annotation tools. Whenever I need to draw attention to a particular element in a screenshot, or write a brief note, I turn to Skitch. Evernote integration. If you're into that sort of thing. 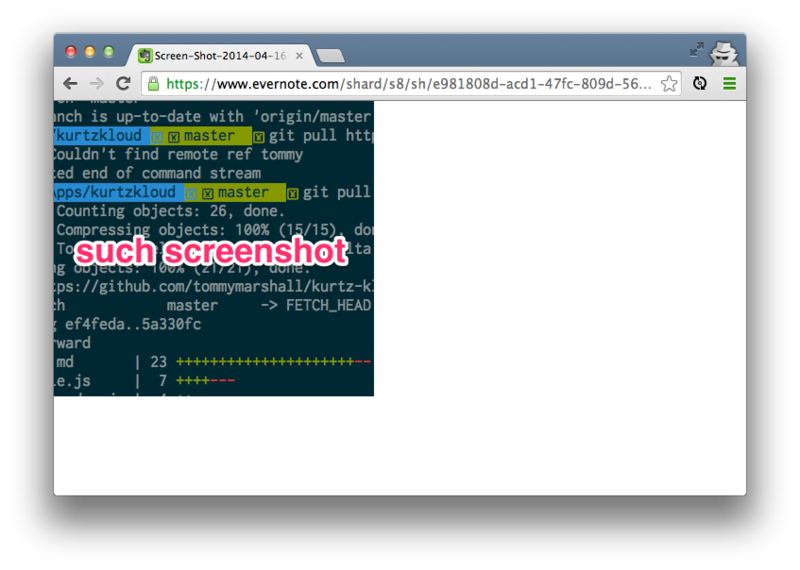 No integration with the native screenshot tools which means an extra step, and no window screenshotting. There are some workarounds to make the process more simple, but the sharing process still requires additional effort. Huzzah! A URL directly to the file! *Dropbox is obviously a paid storage service, but their free tier provides more than enough storage (2GB) for the purposes of screenshot sharing. You're probably using the Dropbox app already. You just need to go and activate the screenshot feature. 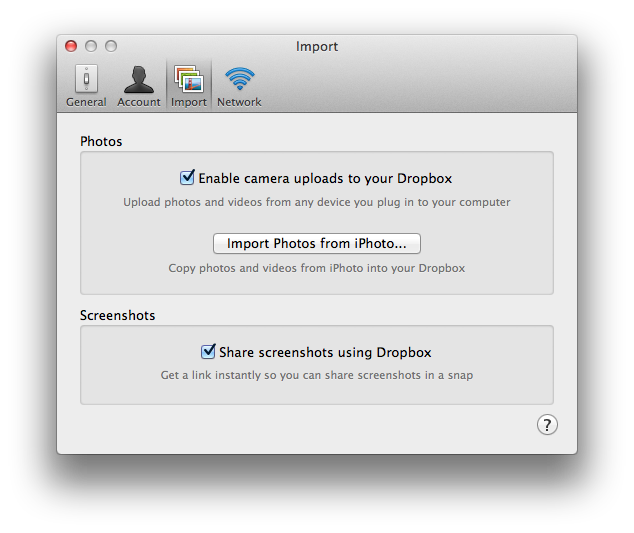 When the auto-upload screenshots feature is enabled, Dropbox does some hijacking of where the system saves screenshots and how they are named. Super simple to use and copied URLs are for actual files, not wrapper pages. Limited to storage on Dropbox. 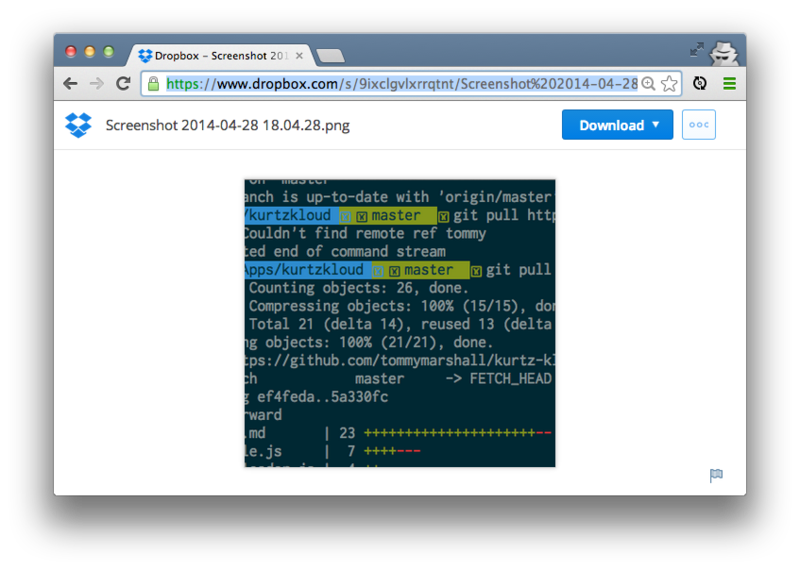 Deletes your screenshots from your system after they have uploaded to Dropbox. This might be a pro for some, but I like to maintain a local copy of my screenshots. There is also no way of seeing previous uploads, so you can lose track of what you've been uploading pretty easily. There are some fantatsic apps out there, but there wasn't one that met all the criteria of my perfect screenshot app. 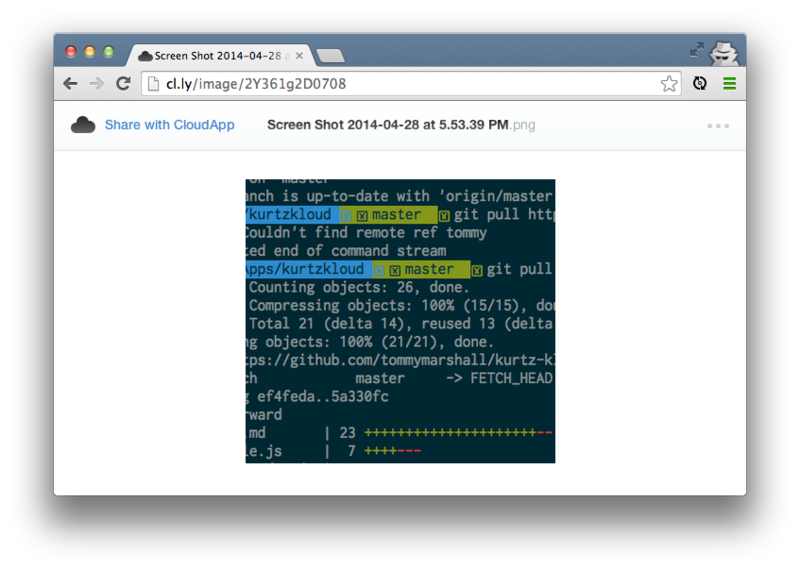 Kloud is a screenshot app built with Node.js by developers for developers. It perfectly suits the needs of simple screenshot sharing. It's also open source and built with the most popular programming language in the world. If it doesn't suit your needs perfectly, you or someone you know can probably just change it! Some technical knowledge is required to install/configure/start the app. Doesn't start automatically when the computer boots. Just a plain old S3 URL. Doesn't get simpler than that. The apps listed above are terrific. I encourage you to try them all. But if you find that just don't cut it (like I did), give Kloud a try. 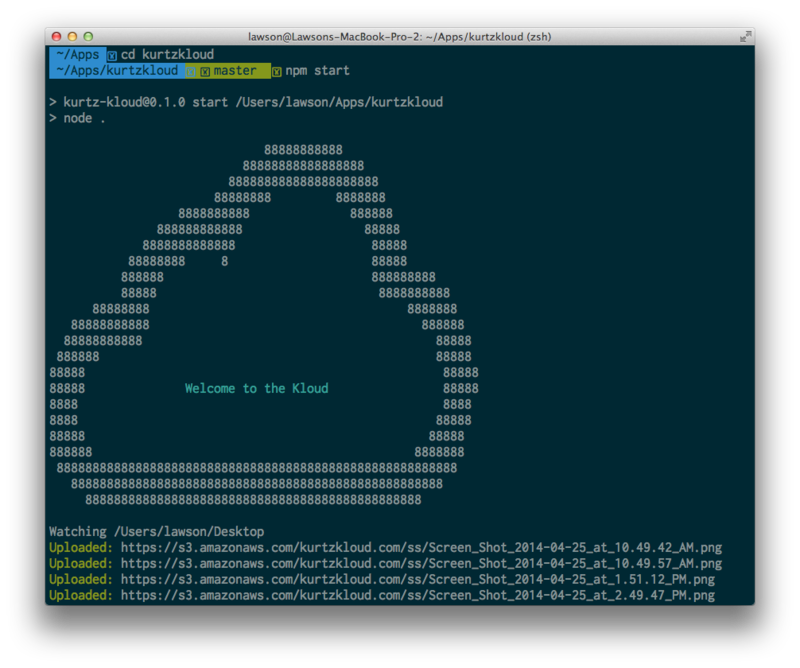 Check it out and let me know what you think at the Kloud repo on GitHub.